Are you a website guru? Can you plan, publish and manage websites while juggling fire and riding a unicycle? Then we want YOU! – Be the go-to person for everything content related to our websites, deepersonar.com (e-commerce), www.deeper.eu (corporate) and more to come. – Manage web content which includes, but not limited to, drafting and structure, visuals, layout optimization and localization. – Know anything and everything on SEO. Keep up-to-date on SE evolution. – Track keyword changes and trends. React accordingly to ensure our websites gain or remain at the top of search engine rankings. – Analyze every aspect of website usage from site metrics to user behavior. Report analysis (trends/discoveries) and make recommendations for changes and improvements. – Manage website maintenance projects with outside agencies. – Build and manage website budget. – 2+ years work experience in website management. – Strong understanding of CMS. Magento a big plus. – Advanced experience with analytical tools (Google Analytics), usability testing (A/B) and user behavior analysis (HotJar). – Basic understanding of HTML / CSS. – Communicate effectively and respectfully. – Be a happy camper. Please send your CV in English, to career@deeper.eu. 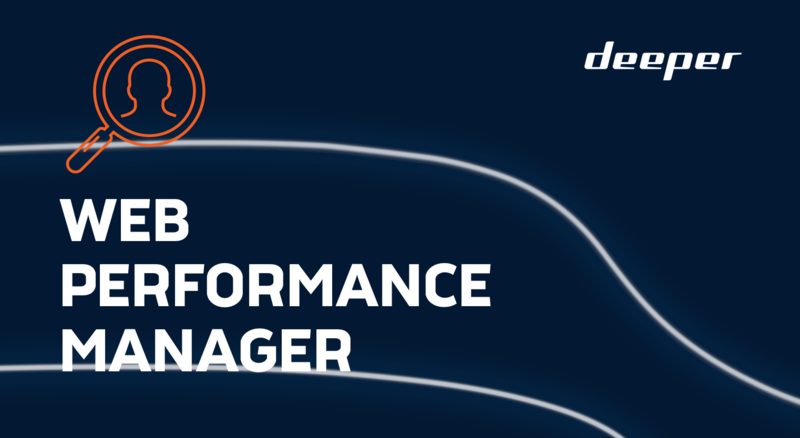 Please use the subject line “WEB PERFORMANCE MANAGER”. Please note, only candidates selected for an interview will be contacted.